The Senate passed Right-to-Work this week. It has a change in the legislation from our House version. We will hear it again in our committee on Monday, then it should be on the House floor and to the Governor's desk! The senate heard Sen. Schatz bill for a prescription drug monitoring system in Missouri. Sen. Schatz and I are working together again this year on this life saving legislation. As you know the senate has been our hold up so once again, Senator Schatz is doing the heavy lifting! As you can see from the photos, the room was packed as well as the hallway outside. Missourians from all across the state came to let their voices be heard about the need for us to join all other states in allowing our medical professionals the ability to have their patients medical information. This is imperative, otherwise a doctor does not have the information they need to make the best decisions for their patient. I will keep you updated as we move through this process. The House moved today to advance legislation meant to spur job creation and economic development in the state, Right-to-Work. The bill would simply ensure employees are able to decide whether to join a labor union instead of being forced to join as a condition of employment. Bureau of Labor statistics show states that have adopted similar legislation have seen employment increase by 13.4 percent between 2002 and 2012. In comparison, employment in states without Right-to-Work grew by only 0.6 percent. Additionally, according to the Bureau of Economic Analysis, Real Personal Income grew by 9.6 percent between 2008 and 2014 in the six Right-to-Work states that border Missouri. In Missouri and its two neighboring non-Right-to-Work states, Real Personal Income grew by just 3.5 percent. Kentucky, just enacted a Right-to-Work law last week. The bill now moves to the Senate for consideration where it is expected to receive approval. Governor Greitens has already made Right-to-Work one of his top priorities and again emphasized the need to pass the bill during his State of the State Address Tuesday evening. We had many representatives stand up and speak on the bills. The support in the House has grown tremendously over the years. I loved seeing these two classy ladies at the Inaugural Ball! Mrs. Shirley Young and Mrs. Haraleen Bowers, pictured with me, are both dear friends from Scott City. Please share with your friends and encourage them to sign up for our reports. Stop by or contact us anytime by calling (573) 751-5471 or via email at holly.rehder@house.mo.gov or tyler.hobbs@house.mo.gov. Thousands of Missourians from across our state made their way to Jefferson City this week to join in the festivities as the state welcomed its new statewide officials. During the November elections Missourians elected Republicans to fill the statewide positions on the ballot. On Monday, Missourians saw Eric Greitens sworn in as the 56th governor of Missouri. Joining him as statewide office holders are Mike Parson, who was sworn in as Lieutenant Governor; Jay Ashcroft, who takes over as Secretary of State; Josh Hawley, who is Missouri’s new Attorney General; and Eric Schmitt, who will now serve as the State Treasurer. They join Nicole Galloway, who currently serves as State Auditor. Galloway is the only Democrat currently holding one of the six statewide posts in the executive branch, and was appointed to the position following the passing of Tom Schweich. House members participated in events throughout the day including an interfaith prayer service and a ceremony to recognize Missouri’s heroes. Those in attendance for the salute to heroes heard from the mother of a Navy SEAL who was killed in Afghanistan. She talked about the heroism of veterans and the importance of patriotism. Greitens talked to the crowd about the importance of recognizing the efforts of the best representatives of the Missouri people. Greitens followed his speech by issuing an executive order banning lobbyist gifts for executive branch officials. The order also prohibits employees in the governor’s office from leaving their jobs to become lobbyists. That evening, members joined the governor for the Inaugural Ball in the Capitol rotunda. Legislators and our families descended the staircase outside the governor’s office as we were formally introduced as members of the Missouri General Assembly. Governor Greitens and his wife then kicked off the ball by dancing to the Missouri Waltz. The festivities continued with a performance by country music recording artist, and Missouri native, Sara Evans. Right-to-Work Legislation Begins to Move Through the House. House Speaker Todd Richardson made it clear in his Opening Day address that the Missouri House would move quickly to pass a Right-to-Work bill. As you guys know me, this has been one of my top priorities since being elected so I didn't waste any time moving it. In just the second week of the 2017 legislative session, in the House Economic Development Committee, we met to discuss five similar Right-to-Work legislative proposals. One of the five was House Bill 91 that I pre-filed in December. You cannot require employees to pay any charity or third party the equivalent of money required to be paid by members of a labor organization. State Treasurer Eric Schmitt also spoke in support of the measures along with the state’s top business groups. Schmitt noted that Missouri is in fierce competition with other states for jobs and that the Show-Me State needs to use every tool in the arsenal to attract new businesses. He said he has met with site selectors and being a Right-to-Work state is at the top of the list of the things they consider when looking for a new location for their companies. As you can see from the photo below, the room was packed with standing room only. The committee went for 3 1/2 hours but I felt for the most part it was very cordial and respectful. As representatives we differ on policy beliefs fiercely at times, but I understand that we are all striving for the same goal - to make Missouri a better place for our families. Our opinions just differ on the best path to that outcome. Our committee met again the next day, rolled all five bills together retaining the language of House Bill 91, and voted it out of committee by a vote of 8 - 4. The bill then received the approval of the House Rules – Legislative Oversight Committee Thursday afternoon. Debate should begin on the House floor next week. A state House proposal aimed at banning gifts from lobbyists to elected officials received first round approval from the Missouri House of Representatives Thursday. HB 60 is nearly identical to a gift ban proposal filed in 2016, which was passed out of the House with 147 votes in favor. In addition to the prohibitions on expenditures by lobbyists for elected officials, the bill would remove reporting requirements that would not be necessary with a ban in place. It would exempt from those prohibitions flowers and plants given as expressions of condolence or congratulations. It would also exempt items such as plaques given to lawmakers when they are recognized by an organization. House Speaker Todd Richardson has said he wants the gift ban bill to be the first thing the House sends the Missouri Senate this session. It was debated on Thursday and is expected to be complete and sent to the Senate next week. 2017 Legislative Session has Begun! 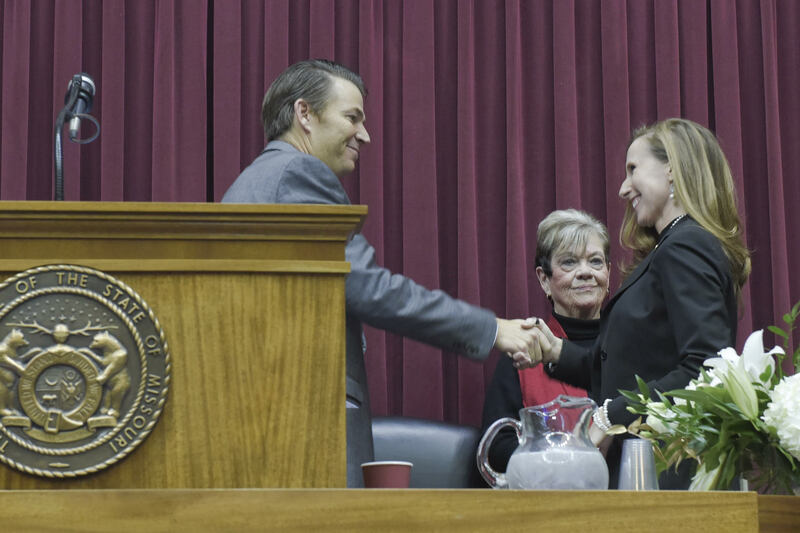 The members of the Missouri House of Representatives convened in the House Chamber on Wednesday, January 4 to officially open the 99th General Assembly. As we begin the 2017 legislative session, the House currently stands at 116 Republicans and 46 Democrats with one vacancy. Of the 162 members serving in the House, there are a total of 39 new members, which includes 20 Republicans and 19 Democrats. The party breakdown in the House means Republicans will once again have a super majority. A super majority with a new Republican Governor. I expect many bills that have been vetted year after year to make it through quickly. I'm sure you know one main priority on our list is Right-to-Work. I couldn't agree more. I would just like to add that it also means we must act. No longer are the days of excuses for not getting much needed reforms across the finish line. I'm excited and honored to be a part of this 2017 Legislature and am looking forward to helping our government get out of the way of our businesses so that they can grow and thrive once again. The Speaker has made right-to-work one of his top priorities for the session. You know how this makes me feel! I profiled the bill in December and will be hearing all five Right-to-Work bills in committee on Tuesday. As the Speaker noted, Missouri is now in the minority nationally and one of the last states in the region that doesn’t allow workers to choose whether they want to join a labor union. He cited statistics from the Bureau of Labor Statistics that show Michigan has added 58,000 manufacturing jobs since becoming a right-to-work state in 2012. In comparison, Missouri has lost approximately 1,200 manufacturing jobs over the last two years. The Speaker also noted that Michigan’s average weekly wage is growing at almost twice the rate of Missouri’s. In his address, the Speaker also called on the legislature to help create a court system that is fair to all litigants. He noted that St. Louis was recently rated the worst judicial jurisdiction in the country, which he said is the result of state policies that have made the city a national magnet for massive litigation. The Speaker said it his goal to get major pieces of tort reform to the floor and over to the senate for consideration early in session. The Speaker said, “We must make Missouri a place where fear of needless litigation is not a disincentive to job creation.” All I have to add is Amen. Richardson also said the first bill out of the House in 2017 will be substantive ethics reform that will ban gifts from lobbyists to lawmakers. Richardson said to his colleagues, “Missourians also want a government they can trust and believe in. Last year we passed the first meaningful ethics reform in modern Missouri history, and we must continue the job we started. A gift ban will be the first bill out of this House.” This bill has also been assigned and will be heard in committee next week. Swearing-in photo for the 2017 Legislative Session. Speaker Todd Richardson and Representative Holly Rehder. On the first day of the 2017 legislative session the Speaker of the House also announced committee assignments for the members of our caucus. The assignments come with a revised committee structure that is meant to allow members to better focus on specific areas of expertise. Previously, members would serve on four to five committees and have their attention spread across numerous issues. During the 2016 session, the House had nearly 60 committees. For 2017 that number will drop into the 30s. With the new structure, members will serve on two or three committees and be able to devote more of their time and attention to the policy areas covered by their committees. The new House committee structure will also allow for the creation of subcommittees to focus in on specific policy issues. The subcommittee structure will allow members to gain additional specialized expertise within the broader issue areas discussed by their committees. I have been selected as Chair of Economic Development. All labor reform bills will be assigned to this committee and we are looking forward to a fast and productive year!